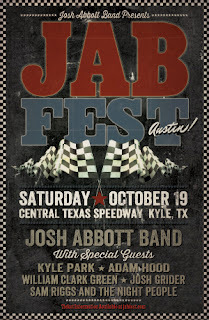 This is the third year for JABFest, the second year to have an Austin edition, and the first year for the Austin show to be held at Central Texas Speedway in Kyle. KOKE FM hosted their 2013 summer music series at Central Texas Speedway, so they help iron out the venue kinks ahead of time. 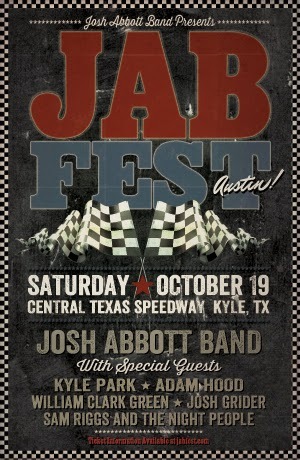 Last year Nutty Brown Cafe hosted the Austin JABFest, and the venue change should give them the ability to bring in a MUCH larger crowd. Tickets are $15 in advance, $20 at the gate and there are VIP tickets available that include early entry, lunch with Josh and a mega swag pack. Tickets can be purchased at frontgatetickets.com.